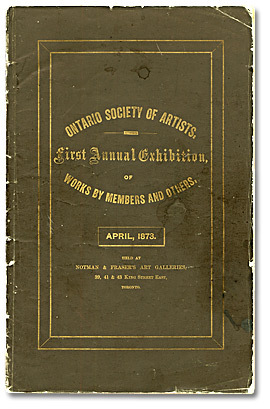 Founded on June 25, 1872, the OSA is the oldest continuing art society in Ontario. The impetus for its establishment came from a small group of seven artists who held their first meeting at the home of John A. Fraser on Gould Street in Toronto. 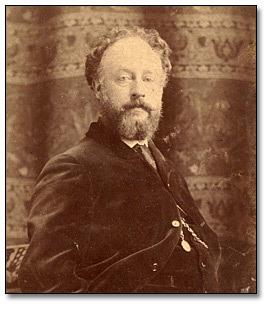 Present were noted marine watercolourist, Robert Ford Gagen, Marmaduke Matthews, best known for his watercolours of Rocky Mountain scenes, Thomas Mower Martin, Charles S. Millard who was born in Ontario but spent much of his life in Britain, James Hoch and portrait artist, J. W. Bridgman. 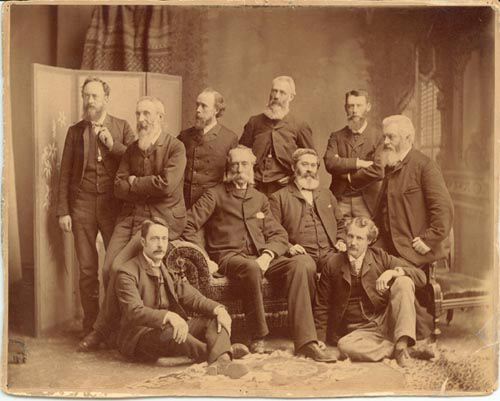 Many of the founding members can be seen in the photograph from 1889 below. A key figure in the early days of the OSA was John Fraser who was born in England and had come to Toronto from Montreal where he was an active member of the Society of Canadian Artists. As a junior business partner in the Notman and Fraser photographic firm, it was Fraser’s skill in hand-tinting and colouring photographs that greatly contributed to the success and expansion of the Notman & Fraser business. The Society's second meeting was held in July, 1872. At that meeting a full slate of officers for the Society was proposed. Artist members were to serve as vice president and secretary and these positions were filled by Fraser himself as vice-president and Herbert Hancock as secretary. The role of president and treasurer were to be taken by non-artists. 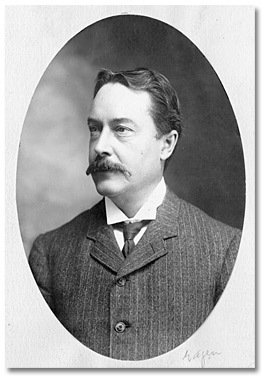 Prominent businessman and future mayor of Toronto, William H. Howland accepted the invitation to become the OSA’s first President while local coal merchant, H. J. Morse accepted the role of treasurer. Morse’s tenure was somewhat short lived however, as he caused the Society financial embarrassment due to the misappropriation of funds to shore up his failing business. During that second meeting, the Society's constitution was also unanimously adopted. It contained sixteen articles, the most important of which called for the establishment in Toronto of a permanent public art gallery and the holding of annual art exhibitions by the Society. 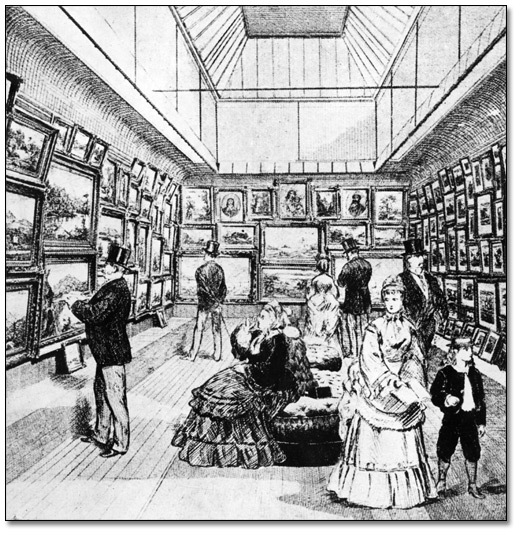 The Society's first exhibition was scheduled to be held in April of 1873. Unfortunately, with little permanent gallery space available in the city, the Society had trouble locating a suitable facility. However, with the construction of the new Notman & Fraser premises on King Street East, Fraser was able to make these available at no cost to the Society. Twenty-eight artists entered 251 works in either oil or watercolour that were hung salon style in a space of approximately 9.14 x 15.24 metres (30 x 50 feet). The exhibition was a tremendous success and drew more than 4,000 interested visitors. In addition, an ‘Art Union’ was held whereby subscribers could purchase tickets in advance for $5. Each ticket provided the chance for one of 50 artwork prizes ranging in value from $25 to $150, a chromo-lithograph of a well-known painting, and unlimited entry to the exhibition. The organization of the annual Art Union was modelled on the practice of art societies in Britain and was intended to foster an appreciation for art amongst the public. However, it consumed much of the Executive’s time and, on more than one occasion, caused difficulty in the misuse of its funds. The Government of Ontario purchased artworks from this first exhibition. 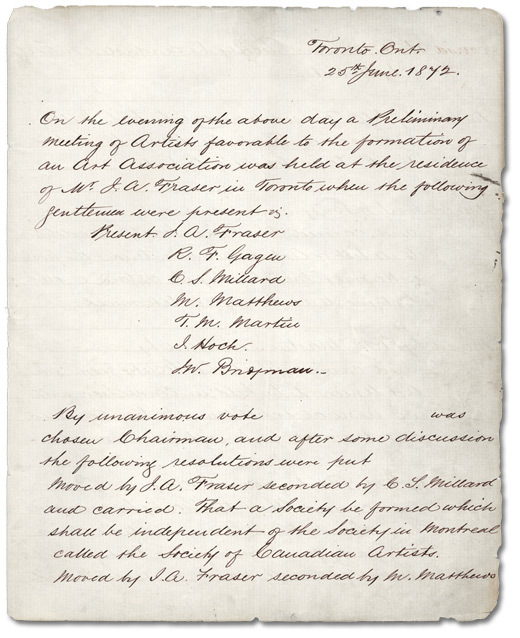 Although no details have survived about the pieces acquired, the amount of $1065 is recorded for the purchase of paintings in both the records of the Society and the Public Accounts of the Province for 1873. The records of the OSA, including details of members and meetings as well as photographs and catalogues, provide a fascinating account of the Society's activities since its founding in 1872. These records were acquired by the Archives from the Society beginning in 1965. Additional donations of records from the OSA were made to the Archives in 1972 and 1993.